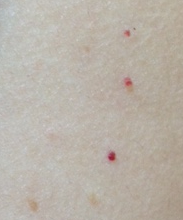 Over the years, I noticed more and more red dots appearing on my skin. They are called cherry angiomas. I recently removed them with the help of my husband. I noticed a drastic increase in cherry angiomas during and after my pregnancy. Let me clearly disclose that my husband and I have no medical training and you should seek the advice of your doctor for your own cherry angiomas. I wanted a natural way to remove cherry angiomas. I was not patient enough to use the cider vinegar technique that I read takes weeks. The way that we removed them was by heating up a needle with a lighter for approximately 10 seconds, lightly touched each cherry angioma until it seemed to disappear, and wiped it with alcohol. We started with smaller ones and then worked our way to larger ones. Here are some examples. You'll notice the red dot on the left side of the photo. My husband heated up the needle and touched it for a few seconds. Woot! It disappeared! This was an easy one, but they weren't all so easy. The next one was larger and on the under side of my upper arm. 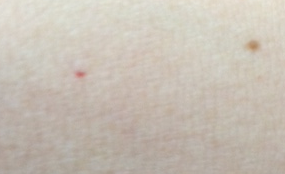 You'll notice that this red dot is much larger and has a weird shape. Within a few seconds, the red dot disappeared. 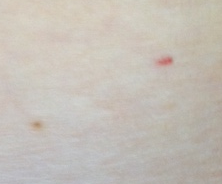 These three red dots were on the side of my torso. These were the largest ones and my husband held the hot needle on them longer. These hurt much worse and swelled up. I had swelling a few minutes later that felt really uncomfortable. 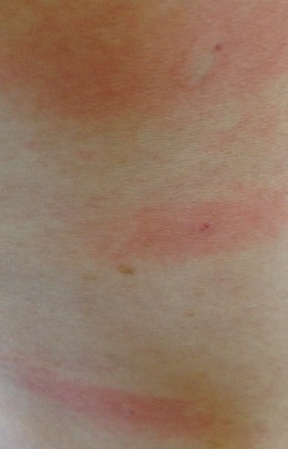 The swelling eventually subsided. They scabbed over. I'll come back and update this post with more photos soon after these heal completely and let you know how things turned out. 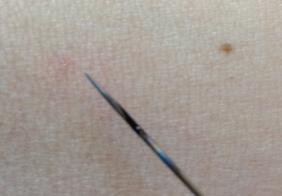 Again, I have no medical training, so consult a doctor before you use a hot needle on yourself! Is that what those things are? My arms are COVERED in them. I hate the way they look. I don't think I could do that myself though. Has it worked? Has it stayed away?? Has it worked?? Has it stayed away?? It did work. They haven't come back. Did they stay brown in color as seen afterwards or did that fade?